BOAT OWNER'S NOTES for 2007 LUND 1900 ProV IFS call boat owner Terry @ 402-499-4364. 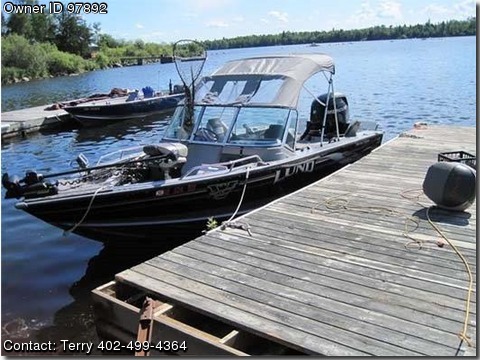 Basic Decription: 2007 LUND 19.8 ft Pro-V IFS, 150 Hp Mercury Verado 4-Stroke-300 hours, 24 V MinnKota Trolling motor, Full Electronics, Fitted trailering cover, full fitted dock cover, Extra Prop, Drift sock, Extras, Tandem axle trailer $29,950 OBO. Other Features: Two bilge pumps, one auto, VSR or battery isolator between main starting battery and accessory battery, Full fitted covers for docking coverage, several pieces for sides, front, top, back, see pic of top below, VSR Voltage Sensitive Relay which allows main engine, to charge both trolling batteries, Marine band radio for safety communications, Front back carpeting, back part snaps out, Merc Smart-Craft gauges, among other things it allows setting the RPM for desired trolling speed, Lowrance X27C at driver's driver's console with 3 Navionics map chips: Canada, N.central US, S.central US. 2013 MinKota Terrova Trolling motor with remote steering, 24 V, bow mount, detachable, 2-bank onboard battery charging system, Wash down system, Two Live wells and two bait wells, separate w/pump circulating systems, Four swivel, height adjustable chairs, Lowrance 3100 at trolling motor, Drift Sock, rod storage, rod trolling holders, spare props, anchor, lines plenty storage. Tandem axle Shorelander Trailer ALL IN GREAT CONDITION, For boat layout see link: www.lundboats.com/pdfs/old-catalogs/2007.pdf Boat Location: Lincoln, Nebraska. Asking Price: 29,750.00, Call boat owner Terry @ 402-499-4364.